Fourteen-year-old Sam Stellar and her cousin Paige have decided to spend the summer working at the Royal Tyrrell Museum of Palaeontology in Drumheller, Alberta, as part of the Summer Studies and Work Experience Program. 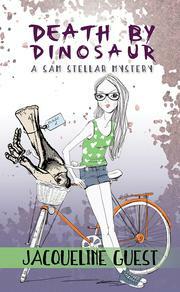 While not the ideal scenario for a summer vacation, both girls try to make the best of it: Paige, a whiz with the computers in the IT department, has one eye on her work and the other on the adorable assistant helping out in the museum, while Sam, a wannabe detective (who has studied online), is convinced there’s a potential theft about to happen. Sure enough, Sam’s hunch proves correct, and a piece from a fossil goes missing. Determined to solve the crime and apprehend the culprit, Sam drags Paige along as her unwilling accomplice, convinced she can unravel the mystery, despite the fact that no one believes her hunches. As Sam closes in on the truth, things get ugly, as she finds herself kidnapped and threatened. Can Sam outwit her foe and save the museum?